Current approaches to spatial normalisation of brain images have made use of a target image to which each subject image is matched. However, in many cases the use of a single brain template, or a statistical one derived from multiple subjects of another population, does not adequately capture the structure present in a population of anatomies under investigation. In such cases this paper proposes that a better approach may be to seek a method of driving subjects in the group into registration with each other, rather than with an unrepresentative template. 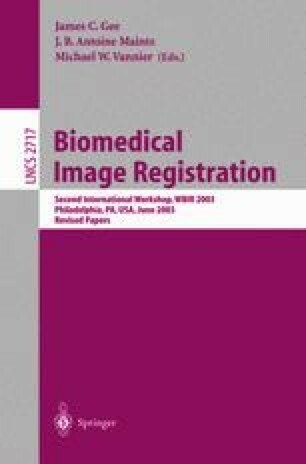 This paper explores the approach of extending registration concepts from multi-modality registration, specifically those deriving criteria from the joint probability distribution of image values, to the general case of describing the alignment of a population of images simultaneously. Geometric constraints forcing the convergence to an average geometric shape are discussed and results presented on synthetic images and clinical brain image data.